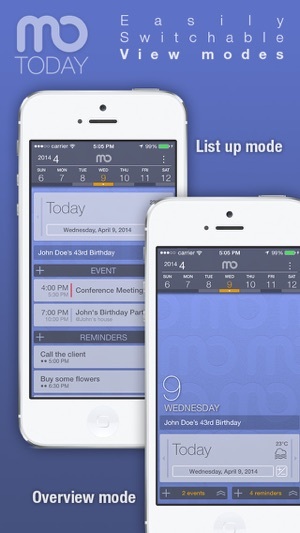 mo.Today is a personal assistant that helps you see your daily events and to-dos in a very simple way. Manage your days by moving freely from 'Today' to a day in the past or the future. Access all of your built-in calendar events and reminders, conveniently organized in one screen. With mo.Today’s unique 'Expose' feature, actively look for the tasks you are 'able to do', rather than passively checking 'to do' items. Just experience it right now. 1. Collect your 'today' in one screen. 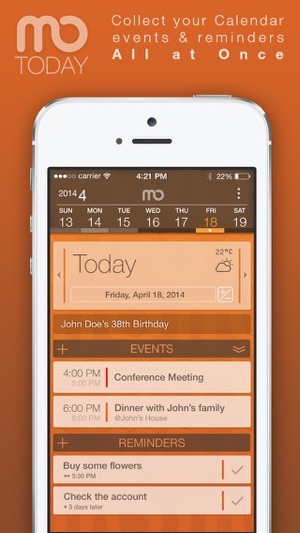 - mo.Today shows all of your schedules and appointments, to-dos and reminders in one screen, in chronological order. Simply open mo.Today to remind yourself what to do at any given moment. - To-do items are listed in the order they need to be completed: "undone" tasks from yesterday appear first, followed by today, tomorrow and after, then "someday"; you don't need to assign priorities manually to decide what to do next. - Check your days at a glance with beautifully designed overview and list modes, and easily switch between the two. 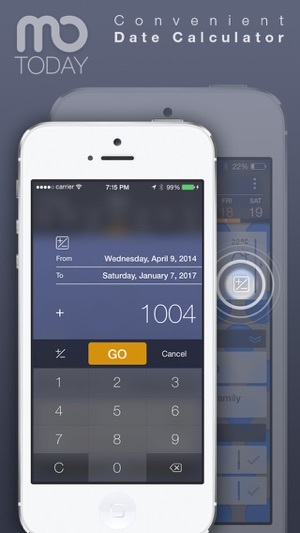 - Not only can you simply swipe the date card to yesterday or tomorrow like a real diary, but you can also jump straight to any date you want using easy-to-switch navigation modes (weekly, monthly and yearly). - Each card shows you how many days are left until (or have passed since) that date. You can quickly return to today by double-tapping the date card. - mo.Today's unique feature, 'Expose', makes to-dos scheduled for future dates visible whenever you want so that you can prepare for them in advance. Without having to set an alarm, you can check not only to-dos for today but also the ones to be prepared in advance simply by opening mo.Today. Experience the joy of pro-active life with mo.Today's Expose in Advance. 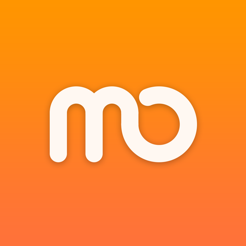 - mo.Today's convenient date calculator lets you quickly figure out the number of days in between two dates, or jump to the date any given number of days away from the current date card you are looking at. How many days away is today from the first day of AD 1? When is the 1000th-day anniversary since the first time you met your girlfriend? 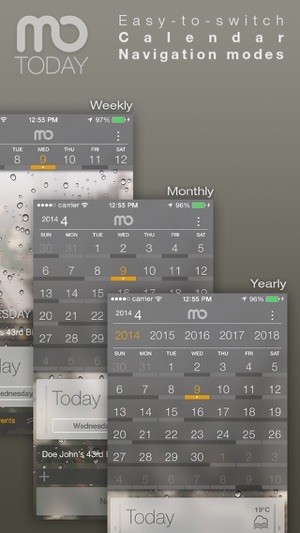 The answers are just a few taps away with mo.Today's date calculator. 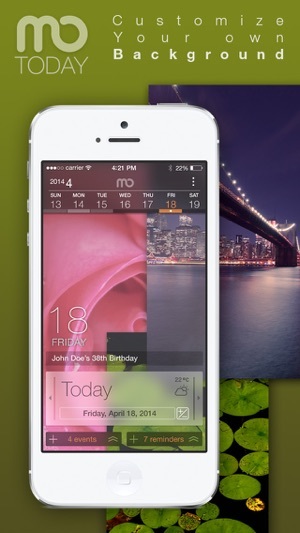 - Translucent UI of mo.Today lets your own images be the elegant background. Choose one from mo.Today's several built-in offerings, or any images in your photo library. - You can customize the look of mo.Today with Dark/Bright skin themes and six color combinations -- make your own flavor of mo.Today. UI is very good and easy to switch different views. Just one small request: could you add weekly/monthly view for all event?